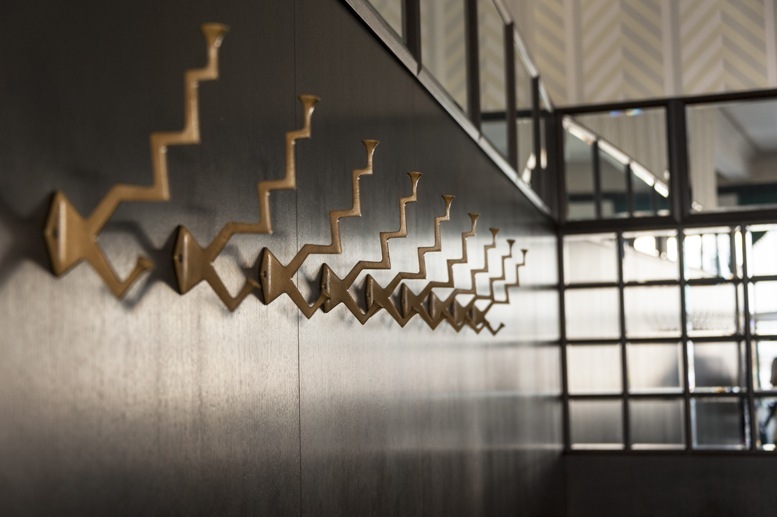 Here, you won’t find a list of hip and cool cafés in the Czech capital – check our friend Kami’s Best Cafes in Prague post if that’s what you’re after. 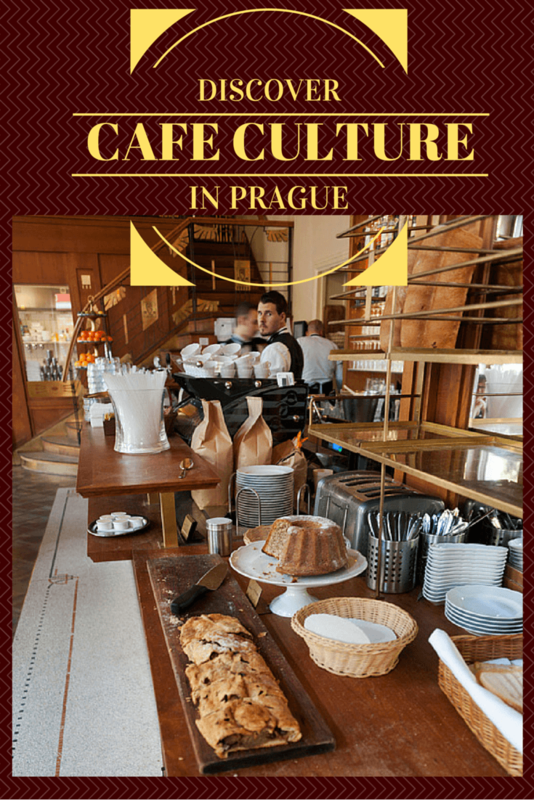 This post is about Prague cafe culture, and how history in the city was shaped by its cafes. In summer, Prague is madness. The old town is completely overrun with tourists and tourist-related tack. Prague castle is hell on earth. Crossing Charles Bridge during the day may take over half an hour, and you’ll be dodging selfie sticks the whole way. Am I saying that you shouldn’t visit Prague? If it’s possible, visit off-season, definitely. 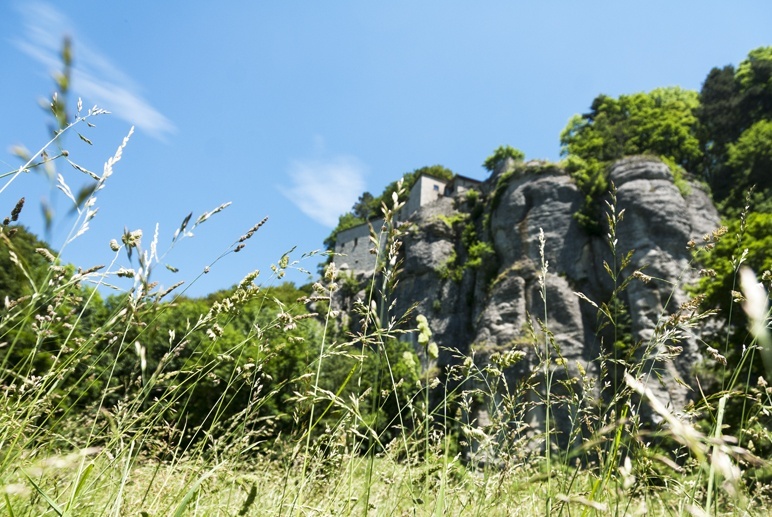 But if you can only be there in summer, try to take it easy – don’t run around like a headless chicken trying to tick off all the sights. 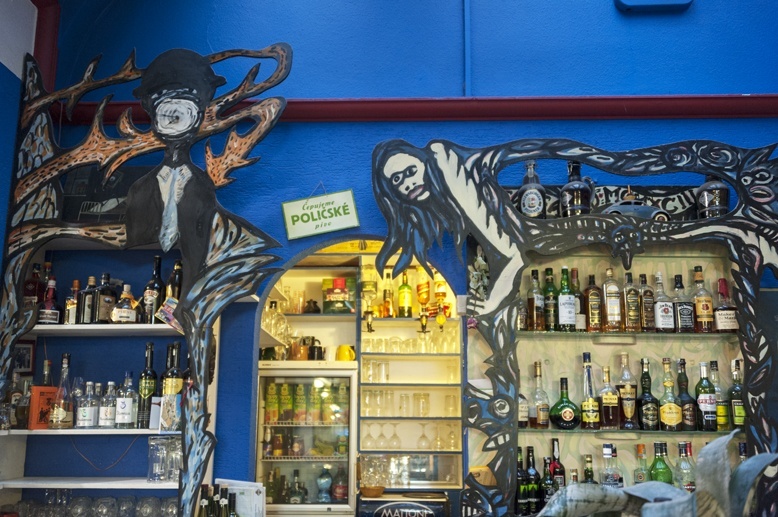 Wander around a park, tour a district like Zizkov or Holesovice, or explore Prague’s stunning cafes. Prague has been part of the Austro-Hungarian empire for over 400 years. 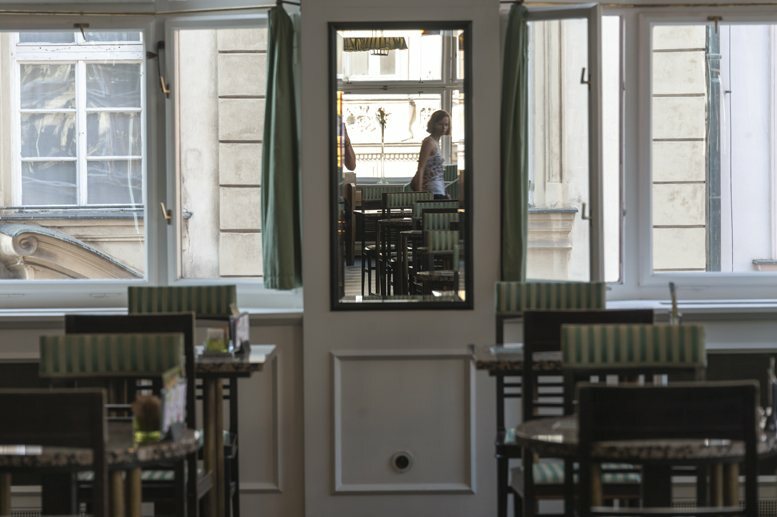 During all this time, the Viennese cafe culture has extended beyond the borders of the imperial capital, reaching Prague and several other cities. 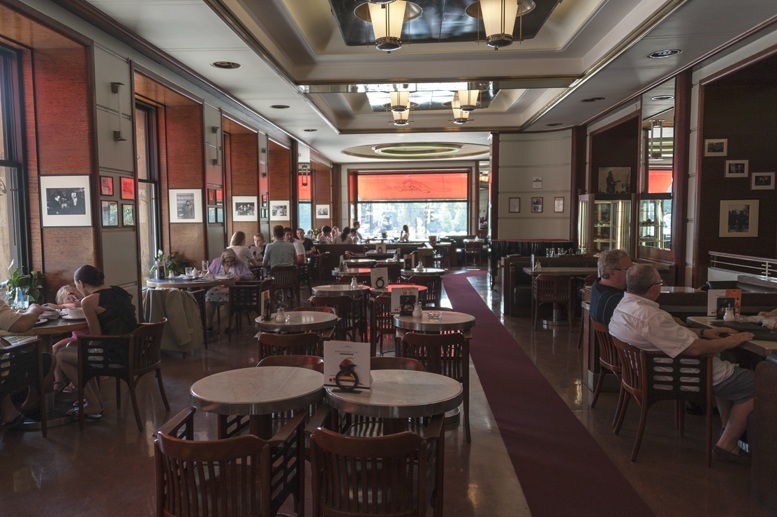 Cafes were not just places to have coffee and cake – they were the headquarters of cultural societies, meeting point of actors, poets and writers. 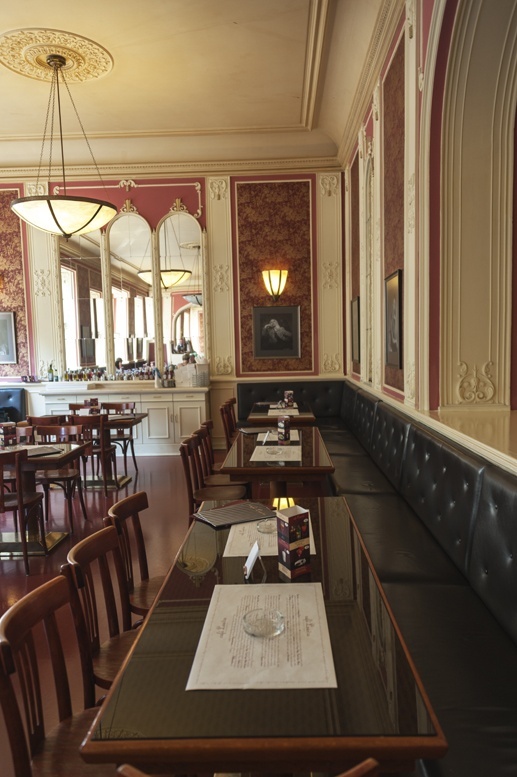 Art and history were shaped at the tables of these cafes, sipping a cup of Viennese melange – or a Czech beer. 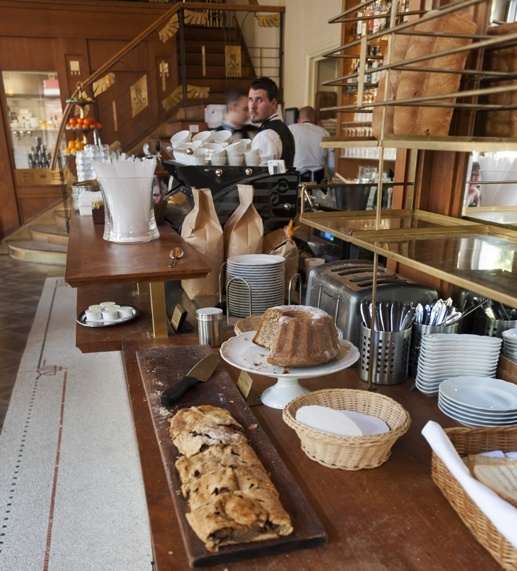 Not only coffees – also delicious pastries. 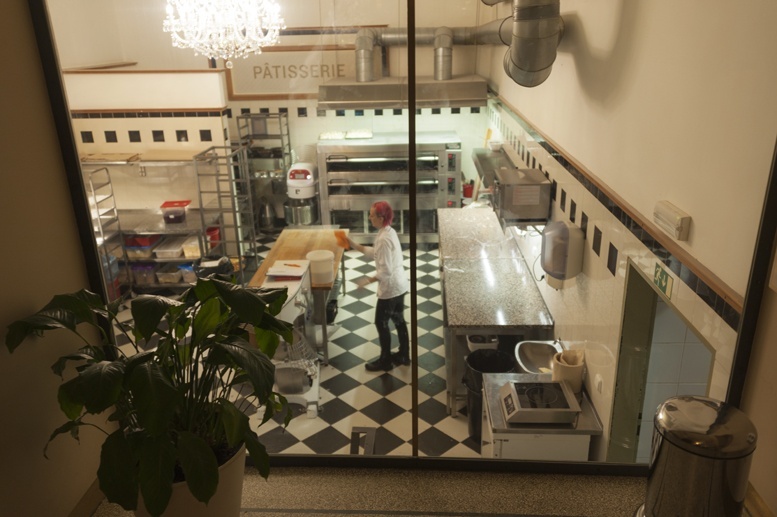 This is Cafe Savoy’s patisserie workshop. 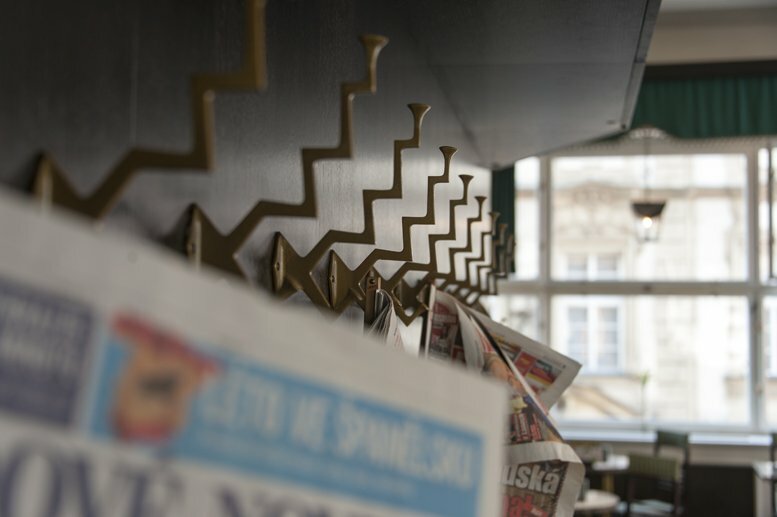 Context Travel has created the ‘Cafe Culture in Prague’ walking tour, taking visitors through the history of the Czech capital over the last century. I ordered a cup of melange, to get myself into the fin de siècle mood. 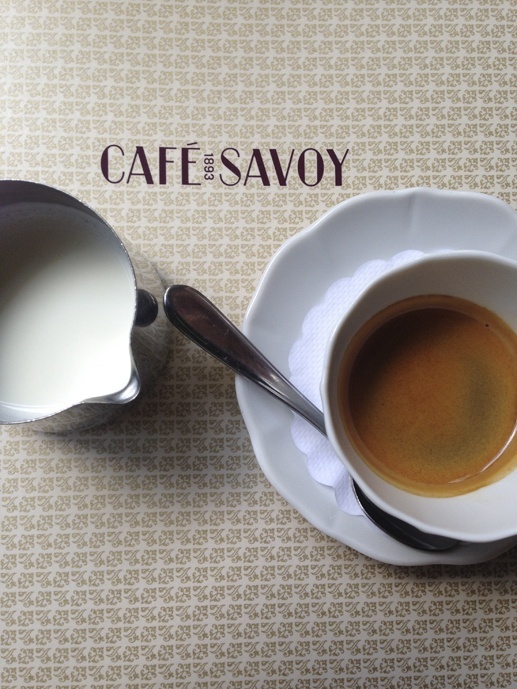 Cafè Savoy is, quite simply, one of the prettiest in town. It was opened in 1893 and decorated in a neo-Renaissance style, with a painted stucco ceiling like the ones you may find in a Medici villa. Marek explained that the late 19th century saw the rise of nationalist movements within the Austro-Hungarian empire, and one of the ways to express nationalist feelings was through architecture. Prague’s golden age was around the 16th and 17th century, when a large part of Prague Castle was built as we see it today. Building in Renaissance style, the Prague authorities were seeking to return to this Golden Age – when Prague was one of Europe’s cultural centres. Another perfect example of Neo-Renaissance architecture is the Czech National Theatre, just across the river from Cafe Savoy. In front of it is Cafe Slavia, with bow-tied waiters and large windows. 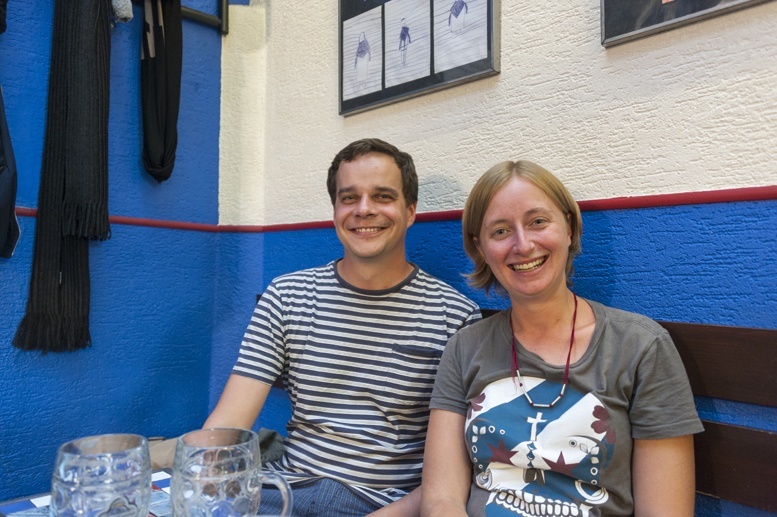 Marek told us that Slavia was said to be the most Parisian cafe in Prague. It was the favourite of actors and playwrights that frequented the National Theatre, and it became the cafe of choice of members of the Czech Surrealist Govement. ‘It’s easy to understand why’, he said. ‘Just come with me.’ He led us to one of the windows overlooking the river. On the other side, Petřín Hill was clearly visible, with the famous tower of the same name on the top, that was inspired by the Eiffel Tower. ‘Toyen and the rest of the Czech Surrealists sat here, and pretended to be in Paris’, Marek explained. We could’ve sat at Cafe Slavia, with its mellow, unpretentious atmosphere, for the whole afternoon, talking culture and pretending to be in Paris ourselves. 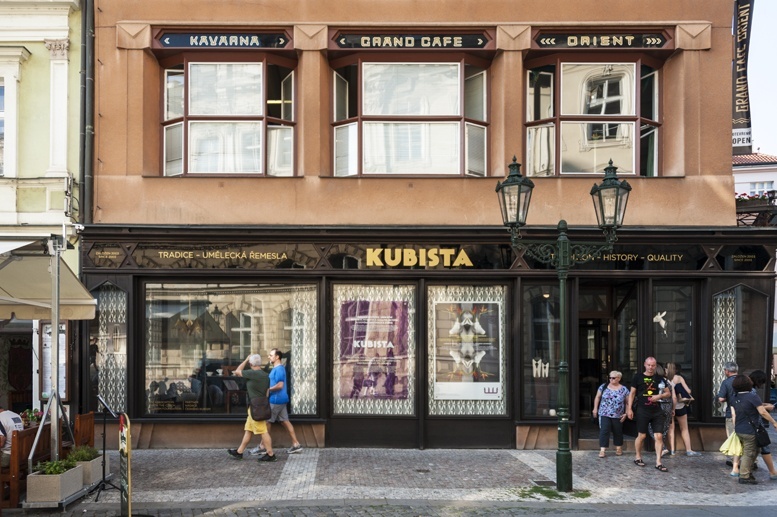 Cafe Slavia was also one of the few cafes that weren’t closed during Socialist times – strangely, as being an ‘artist hangout’ it was associated with the dissident community in Prague. It was in Cafe Slavia, in fact, that Jiří Kolář, Václav Havel and others met during the lead-up to the Prague Spring in 1968. 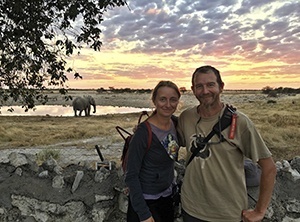 We loved the fact that the Cafe Culture walk didn’t follow a set itinerary – Marek knows so many cafes, the walk can cover two or twenty of them, depending on what clients want. 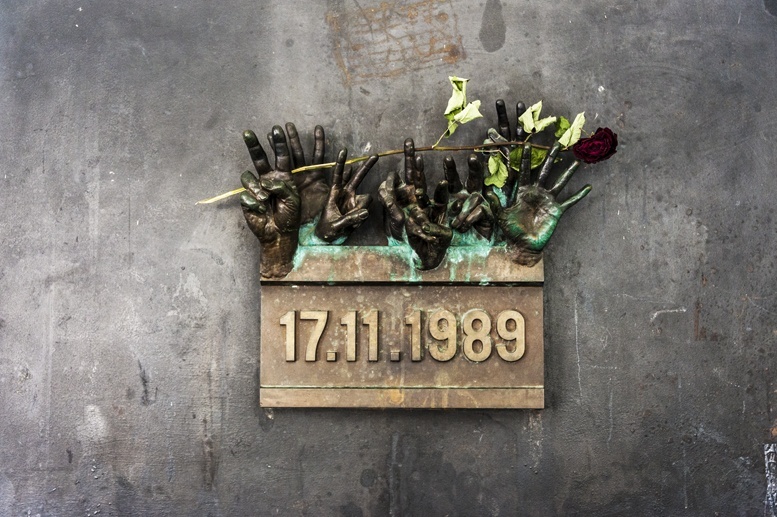 Marek led us to a small memorial to the Velvet Revolution – steel hands and a date, 19 November 1989. Then, he handed us a picture, showing police standing in front of a student rally. We immediately recognised the steel and glass building just across the road. That’s were the student rally that sparked the Velvet Revolution took place. At the time, Marek was ten years old, and he remembered it clearly. There was this feeling of history being in motion. people were no longer afraid to speak up. This is the time, he thought. Things were finally going to change. Just upstairs from the memorial, we found Cafe Louvre, looking out of a black and white film. There was a wardrobe where you can check your hat, a dimly-lit billiard room and a smoking section, were a lone man with a cigarette read a newspaper. If Slavia was the theatre people’s hangout, Louvre was the place for writers. Kafka and his friend and editor Max Brod used to meet here. The philosophy society of Prague also had its headquarters in the cafe. The place felt quiet and wonderfully retro, a world away from the dime-a-dozen ‘beer bars’ crowding the streets of Prague’s historic centre. 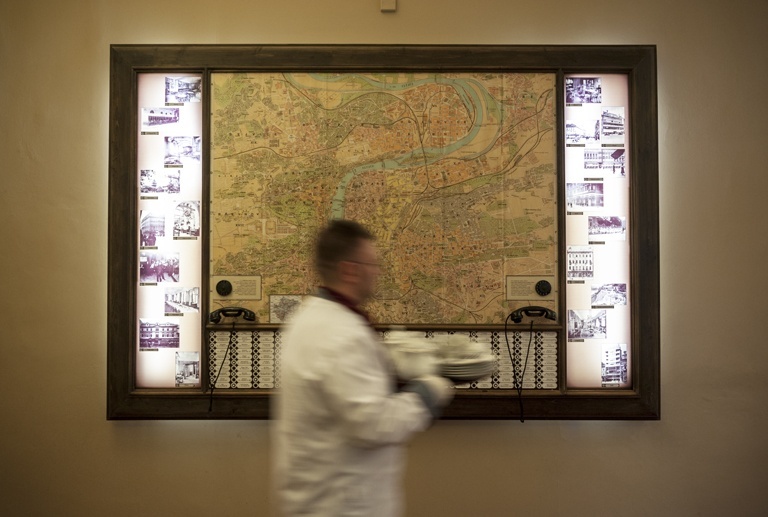 On a wall of the cafe, there was a large map of Prague, with a telephone and a series of buttons, each of them connected to a different cafe. Before the cafe was closed during Socialist times, people could use that telephone to call the other cafes in Prague. I asked Marek how many cafes survived. Only about a dozen out of forty, sadly. During Socialist times, most cafes were closed off by the Socialist Government, and were only reopened recently, and renovated to their old splendour. 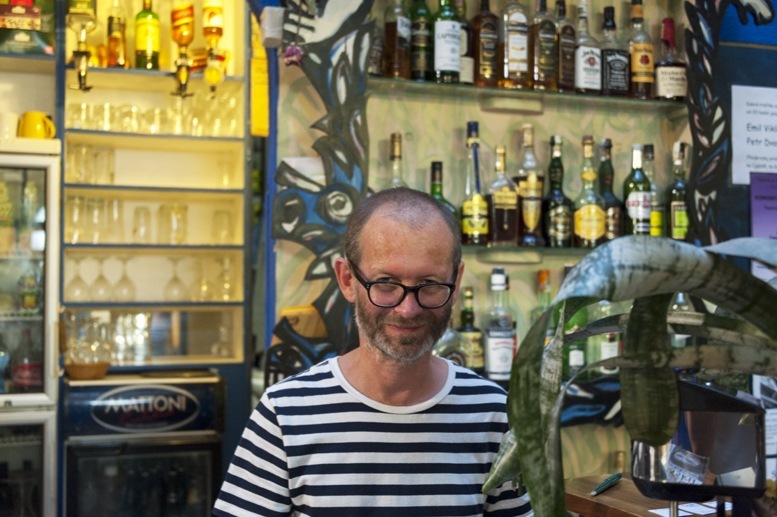 A great example of a recently renovated cafe is Cafe Orient, perhaps the only Cubist cafe in the world. We were familiar with Picasso’s cubism, but Cubist architecture, I had never heard of. Marek explained that Cubist architecture is quintessentially Czech, and it is characterised by geometric patterns, crystal-like shapes and heavy volumes – you can find good examples of it near Vinohrady Hill. The entrance to Orient looked like that of a Swiss bank rather than a cafe, looking impregnable with thick columns around the doorway. But once inside, the place was airy and bright, with hangers shaped like stairs and geraniums on the balcony. What you see here is a copy, Marek explained. 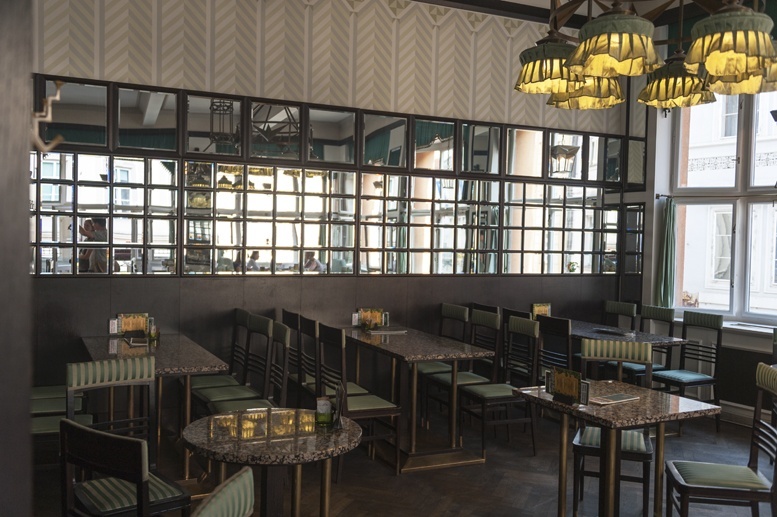 The place was closed down during Socialist times, and it was reopened only a few years ago, thanks to an architecture enthusiast who sourced ancient prints and photographs and commissioned furniture and decoration identical to the original. Dozens of cafes were lost during Socialist times, with period buildings knocked down and original furniture stripped off because it was too ‘bourgeois’. But the same happened at the end of Socialism; several cafeterias that served cheap and filling lunches were closed off. Fast food and touristy restaurants replaced them. Many of these cafeterias were located in the passages around Wenceslas Square. 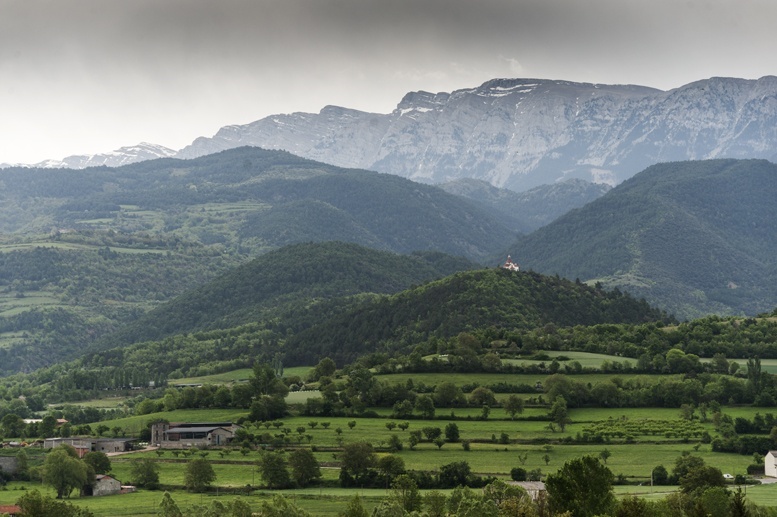 One of the few surviving ones is Jidelna Svetozor, where coincidentally we had had lunch that day. I know I’ll risk sounding controversial here, but I love Wenceslas Square, and especially its ‘palaces’ or passages, covered arcades connecting buildings with one another, containing cafes, shops and restaurants. An interesting one to visit is the Lucerna Palace, the first ‘palace’ to be built between 1907 and 1920. 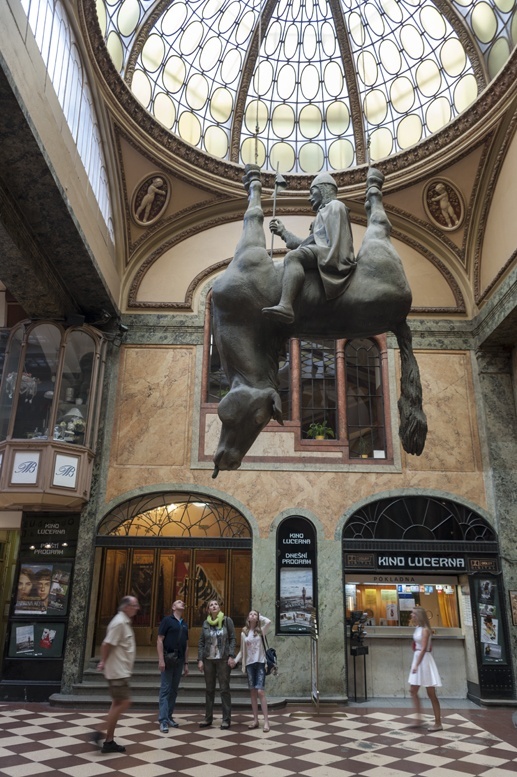 There, you’ll also find David Černý‘s famous upside down horse, originally created for the main post office, but moved to Wenceslas Square first, and to Lucerna Passage then, because the post office director considered it too ‘daring’. 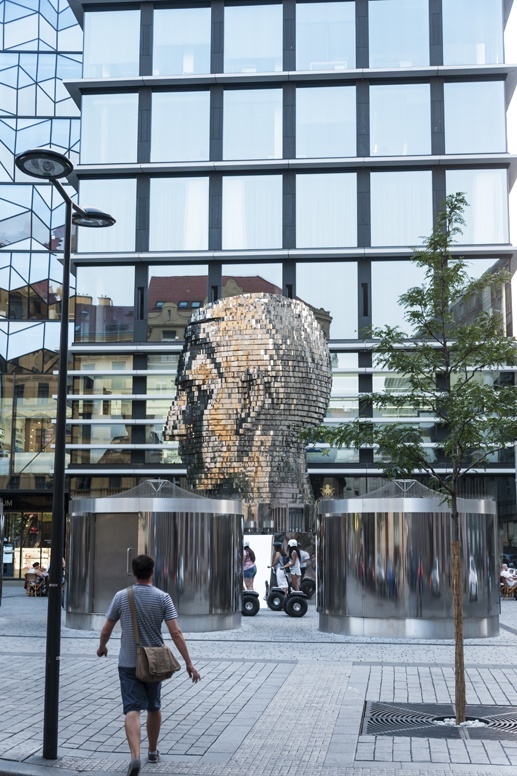 There is an agreement between the artist and the Havel family (yes, Vaclav Havel’s own) that owns the passage, that the horse will remain in the current location until the Czech Republic becomes a monarchy. Černý rarely comments on his works, but some have interpreted the ‘upside-down horse’ to be a satyrical reference to the 1998 ‘opposition agreement’ between the Czech Republic’s two main parties, seen by many as a betrayal of democratic principles. 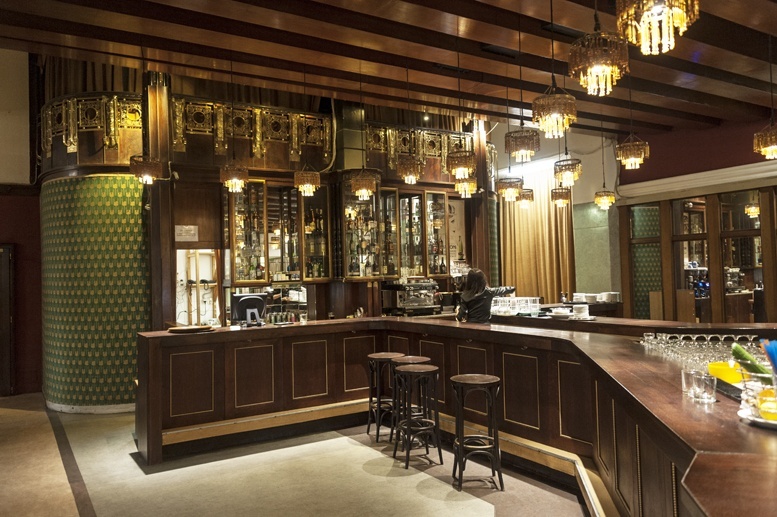 Lucerna Palace is one of the best examples of Art Deco in Prague, and it was built by Vaclav Havel’s grandfather. The Havel family made its fortune with cinema during its early days. 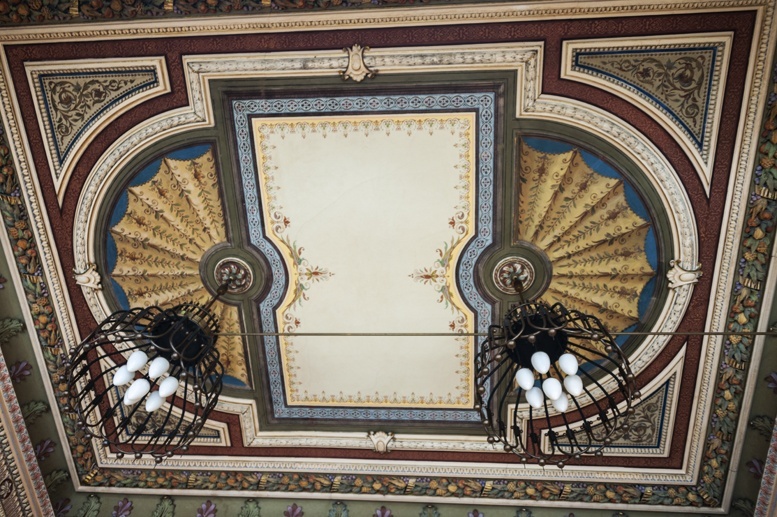 The Lucerna Cinema and cafe of the same name are still open, beautifully decorated in pink and grey marble with amber chandeliers. We walked through the cafe that forms the entrance to the cinema, and saw generations of Prague citizens sitting side by side – the cool young ones, on their way to an art-house premiere, and elderly couples, sipping melange and eating cakes. Over the last 20 years I have seen dozens of 20th century cinemas close, all over the world, replaced by sterile looking multi screen affairs, selling buckets of popcorn and supersize-me drinks. Lucerna looked like a memory from my childhood, when I went with my mum to chocolate-box cinemas in Milan, with a velvet curtain and intermission half way through. Shame the movie was in Czech, or I would’ve stayed for sure. Marek ended his tour at his favorite cafe, so deep into the passages of Wenceslas Square that I felt in a maze. This, for me, is the real beating heart of Prague. There’s nothing authentic about the centre of Prague anymore, buried under tourist tack. In the Wenceslas Square passages, you get a glimpse of local life. People heading to work, going for lunch or queuing for ice cream, shopping or making their way towards the Franciscan Gardens, a real hidden secret behind the behemoth square. Marek’s favourite cafe, named Rehor Samsa after the hero of Kafka’s Metamorphosis, is tiny, with books everywhere. It’s a meeting place for literati, now that the golden age of Slavia and Cafe Louvre has passed. The owner is a tiny man, the stereotypical bookworm. ‘Ah, but you should see him when he gets drunk! When the party gets going here, everyone pulls their own beer and puts money in the register’ explained Marek. It was the perfect ending of the tour. 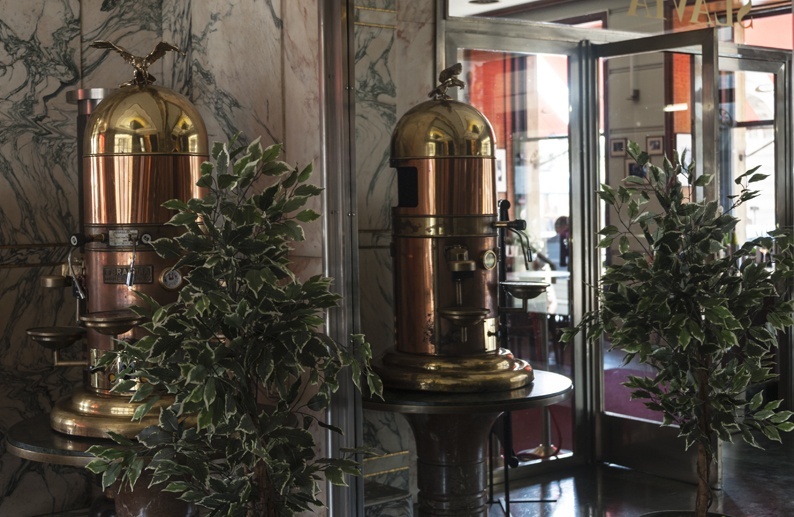 We had toured places where history and culture of the 20th century were written – stunning cafes indeed, but they do belong to the past now. At Rehor Samsa, history and culture are in the making. People borrowed dusty books from the shelves, a young woman sketched on a notepad – I wonder if the next Kafka was sitting at one of these tables, writing the tale of the next Rehor Samsa.